Ice Cream Bar in San Francisco serves old-fashioned soda fountain drinks. I never order off the menu because I prefer to experiment and create my own sodas using the many essential oils, tinctures, and syrups Ice Cream Bar has on hand. Try one of my creations if you’re in town: a phosphate soda with pineapple syrup, fresh strawberries, and cloves. It’s an interesting drink for two reasons. First, the flavors pair well according to Foodpairing’s scientific analysis. Second, the flavors don’t mix – they come in waves: first the pineapple, followed by the strawberries, finishing with the cloves. I did not expect a sequence of flavors when I came up with the drink. Ice Cream Bar’s sodas are old-fashioned because they use one of three old-style acidulants to offset the syrup’s sweetness: acid phosphate, lactart or citric acid. 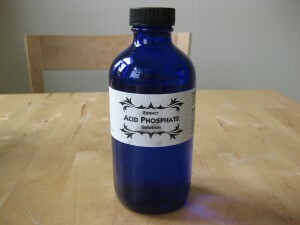 Acid phosphate disappeared in the 1950s and was only recently revived by Darcy O’Neil at Art of Drink. 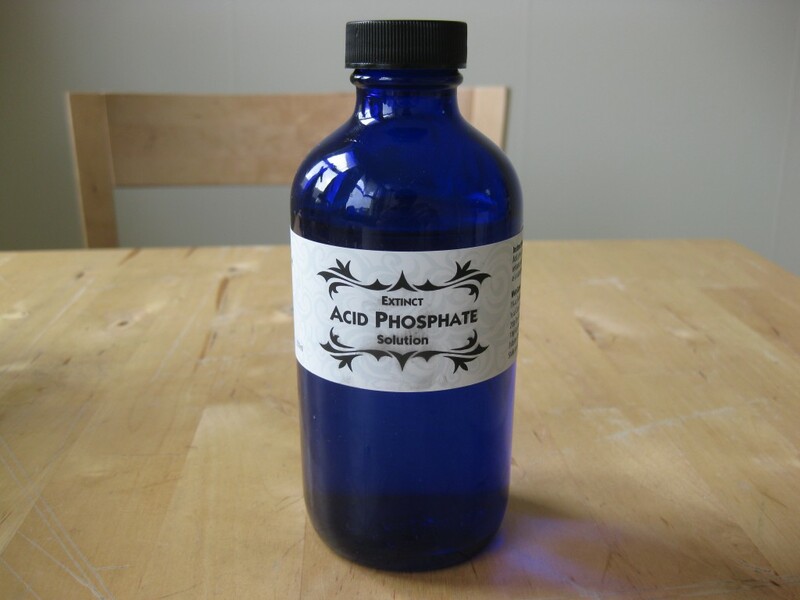 Old-fashioned sodas made with acid phosphate taste very different from today’s modern sodas. According to Modernist Cuisine, a raw cucumber is 96% water. 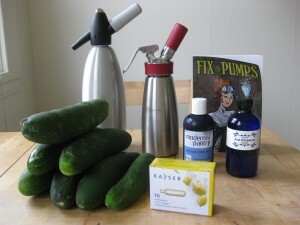 I started with 2121 g of cucumbers to yield a lot of cucumber juice to experiment with. Peel the cucumbers to remove any bitterness from the skin, leaving 1714 g of peeled cucumbers. 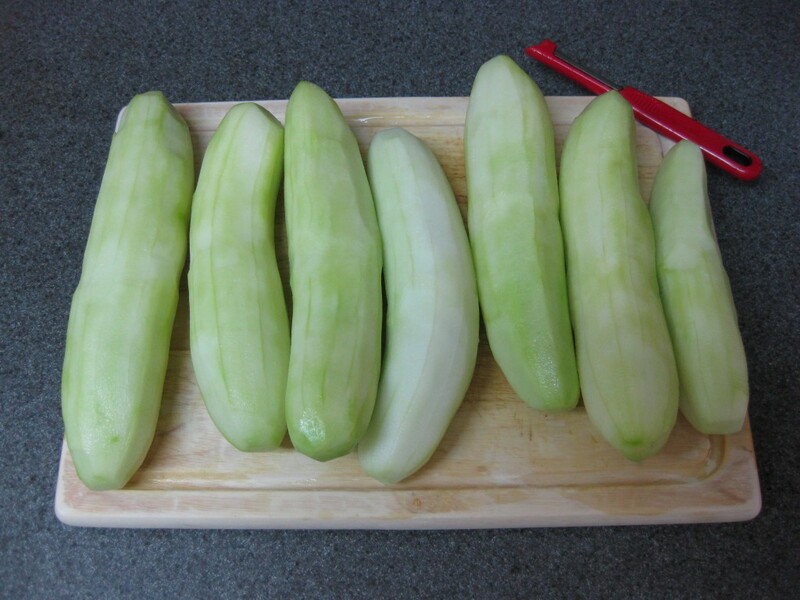 Chop the cucumbers up and blend them with 0.4% by weight of Pectinex Ultra SPL. As previously explained in our banana juice sorbet post, adding pectinase breaks down the cell walls of fruits and vegetables to release more water in the juicing process. Centrifuge the cucumber puree for 1 hour at 1500g. 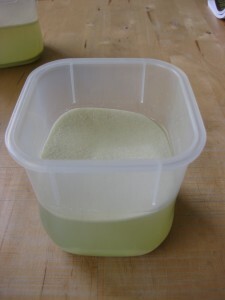 After centrifuging, the cucumber separates into three layers. The first layer is white and floats on top of the cucumber juice. It might be the less-dense pulp from the seeds, I’m not really sure. It does not taste good – it’s slightly sour. 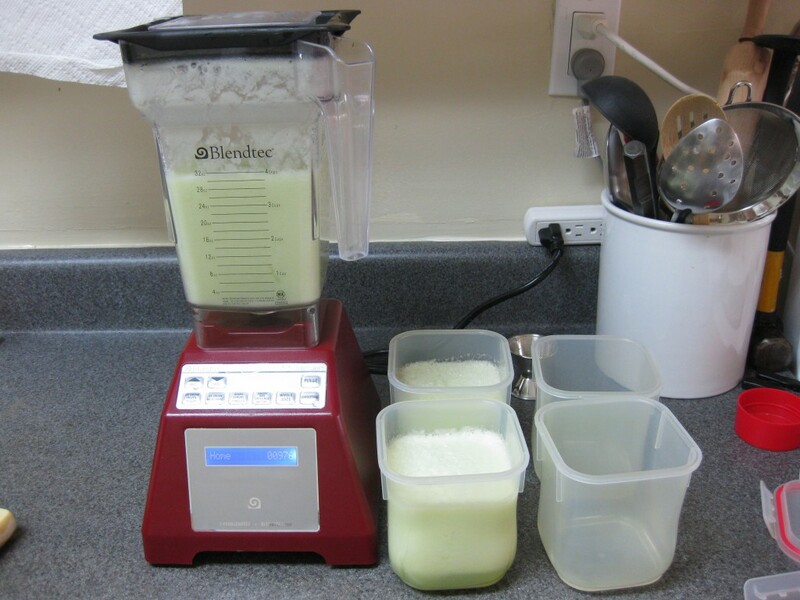 The second layer is what we’re interested in for this project, the cucumber juice. 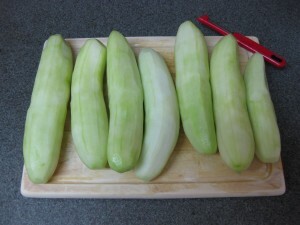 The thin third layer at the bottom consists of green cucumber solids. The solid cucumber paste tastes sweet and has a pure cucumber flavor – I’m not sure how it can be used yet. Here’s a cucumber separated into its constituent parts. 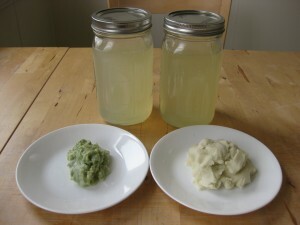 From 1714 g of peeled cucumbers, I extracted 1499 g of cucumber juice, for a 88% yield. That’s pretty close to the 96% theoretical maximum juice yield. Heat the cucumber water and sugar in a pot on the stove until the sugar dissolves. Let the syrup cool in the refrigerator. 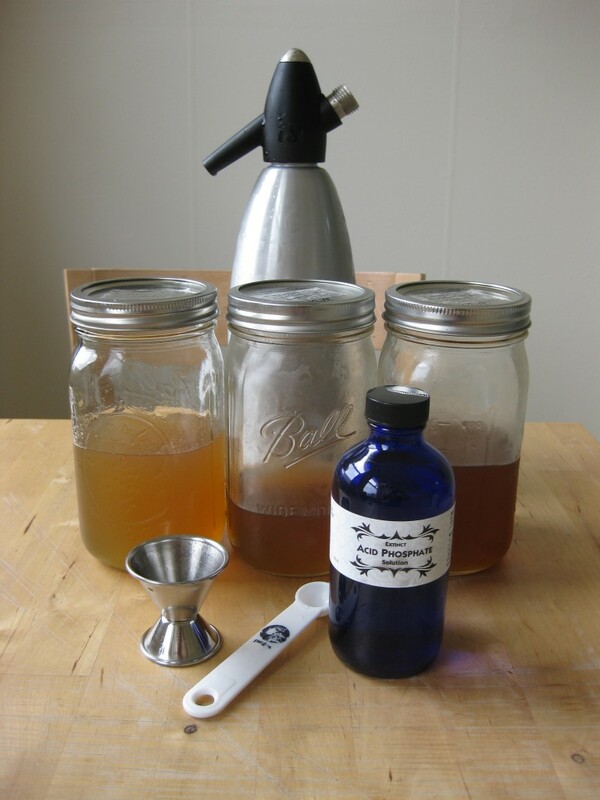 While the syrup is cooling, put 1L of water into the iSi soda siphon and charge with two CO2 chargers. Shake the siphon to help the CO2 dissolve into the water and then place the siphon into the refrigerator. Dispense the water into the glass. Then add the syrup and phosphate and stir. I should have saved a cucumber to garnish the drink with a cucumber slice and some fresh mint. The first picture shows an iSi whip because I tried carbonating the cucumber juice directly. I carbonated 1 cup cucumber juice in the whip to try to maximize the cucumber flavor, and then added 1 oz cucumber syrup (1/1) and 1 tsp acid phosphate. One of the weird patterns I’m beginning to observe is that juice that has been carbonated directly does not taste good. Carbonated watermelon juice tastes terrible, as does this carbonated cucumber juice. Perhaps the carbonic acid is doing something to the sweetness – directly carbonated juice just tastes blah or flat, even after adding in syrup and phosphate. 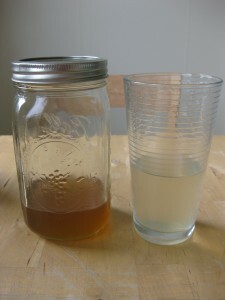 It’s better to carbonate plain water and then add the flavored syrup in later. The 2:1 sugar:cucumber mix was too sweet. I use organic cane sugar and the taste of the sugar overpowered the taste of the cucumber. The 1:2 sugar:cucumber mix was too thin for mouth feel. Even though the extra cucumber juice should make it taste more like cucumber, it felt watered down. The 1:1 sugar:cucumber mix was the right balance. The soda was the right density (I forgot to measure it with the refractometer). Cucumber is a generally mild flavor and it shone through well with this combination. This version comes pretty close to the Mr. Q Cumber soda, but with a different sour profile due to the acid phosphate. I really liked the outcome – it was a light and refreshing soda. Even though I used modernist techniques such as pectinase and a centrifuge to boost the cucumber juice yield, the real star of this show is the old-fashioned acid phosphate. This was a great blend of modernist tools and historical ingredients. Head on over to Art of Drink and check it out.